Our bride wanted to have a fun theme for her wedding reception and she chose Apple Art for her table names and table place cards. We were able to design and print her wedding reception place cards and table cards with colorful apple icons, including red, blue, yellow and green. Our bride’s wedding menu options were Fish, Red Meat, Chicken and Vegetarian. See above, Red Apple=Red Meat Entree Choice; Blue Apple=Fish Entree Choice; Yellow=Chicken Entree Choice; Green Apple= Vegetarian Entree Choice. We also designed and printed with computerized calligraphy our bride’s table names. Our bride also need her wedding invitation envelopes addressed with Hyegraph’s Digital Calligraphy Service. 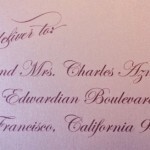 You can see our font styles on our Envelope Addressing Section. Our bride chose Cedarville Cursive Font Style in black ink for her place card printing. 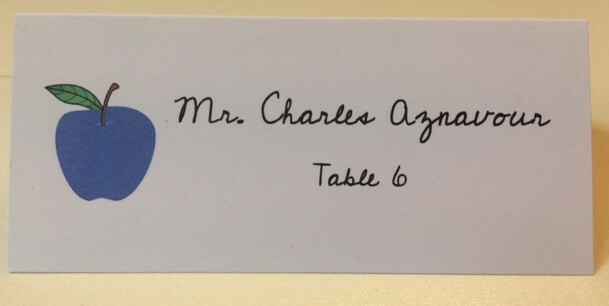 The place cards include the apple icon, the guest name, and the table number. The color of the apple icon corresponds with the guest’s entree choice. $1.25 printing with apple art work. $60 for 100 blank printable place cards.